THE VENTURES-IN THE VAULTS VOLUME 5. When Don Wilson and Bob Bogle founded The Ventures in Seattle in 1958, little did they know that fifty years later, in 2008, they would be inducted into the Rock ’N’ Roll Hall of Fame. In the intervening fifty years, The Ventures sold over 100 million records. This makes The Ventures one of the most successful instrumental bands in musical history. Fifty years previously, The Ventures story began when Bob Bogle went looking for a used car. It was at The Bargain Spot, that Don Wilson and Bob Bogle first met in 1958. Bob Bogle was looking to buy a used car. So he headed into the used car dealership owned by Woodrow Wilson, Don Wilson’s father. At The Bargain Spot, Bob saw a used Hudson, which he bought. It was whilst buying the Hudson, that Bob met Don Wilson. They soon became friends. The reason for this, was Bob and Don were both keen guitarists. Soon, Bob’s trips to The Bargain Spot became more frequent, with the pair enjoying their discussions about music. Not long after this, a a vacancy at Bob’s workplace came up. He told Don, and Don got the job. After this, Bob and Don were spending all their time together. This wasn’t just at work. Both Bob and Don owned guitars. Woodrow Wilson had taught his son a few basic chords on the tiple, which was not unlike a ukelele. Now, Don had graduated to the electric guitar. Bob and Don both owned Harmony and Kay guitars, which they had bought at a local pawn shop. They played it through a shared amp. This rudimentary setup was okay for practising with, but not for playing professionally, which Bob and Don decided to do. By late 1958, Bob and Don wanted to form a band and make their professional debut. So Bob bought a Stratocaster, and Don a Musicmaster. They plugged their new guitars into a Fender Twin amplifier, which like the guitars, they bought at Joos Music Shop in Seattle. As an added bonus, the new equipment came with free guitar lessons from shop owner Art Joos. He taught Bob and Don new chords. They were enthusiastic students, who were both keen to learn. So much so, that they were progressing faster than Art could teach them. Soon, they were ready to make their professional debut. This came at the Elks Club, in Moscow, Idaho. Bob and Don were billed as The Bob Bogle Band. They’d spent time honing their sound, and learning songs that suited their audience. Don’s natural gift for comedy, meant they were well received by the audience. Having made their debut, Bob and Don were even more determined to further hone their skills. This, they realised, was just the beginning. Bob and Don continued to practice, until they became good enough to record a demo. They recorded a demo tape of their most popular songs, including Walk, Don’t Run. Don’s mother, Josie, heard the demo and contacted C&C Distributing. They were responsible for distributing most of the labels in the Northwest. Bob and Don got a break. C&C Distributing recommended that Bob and Don get in touch with Bob Reisdorff, a former employee of C&C Distributing. He was running his own label, Dolton. Josie arranged an interview, but Bob Reisdorff turned the duo down. Little did Bob realise, he’d kissed goodbye to one of the biggest American groups of the fifties and sixties. For Bob and Don, that they’d failed the audition only made them doubly determined. They auditioned for Bill and Grover’s Variety Show, which was hosted by Bill Wiley and Grover Jackson. The winner of the audition won a spot on a local television show. Bob and Don, billed as The Versatones won the talent show, and won the right to play on television. However, that night, they also met Nokie Edwards. Nokie Edwards was, in Don’s mind, the best guitarist, he’d heard. It was then that Bob and Don had an idea. Although they’d won the audition as a duo, they might be received received as a quartet. So, Bob and Don invite Nokie to join The Versatones. With two becoming three, there was a problem. The Versatones needed a drummer. Nokie, however, knew Skip Moore. He agreed to join an expanded lineup The Versatones, as they made their television debut on 20th March 1959. It was on the television show The Versatones met Nancy Claire. She was a country singer, who played guitar. However, Nancy Claire also had a show on local radio station KAYE. Nancy needed backup. This was where Bob and Don came in. The act would be billed as Nancy Claire and The Versatones. This was good publicity for The Versatones. However, Bob and Don weren’t getting paid. That was the downside. Despite this, they accompanied Nancy, to get the publicity. This worked. Soon The Versatones were one of the busiest bands in the local area. They were playing six days a week, ten hours a day. It was a gruelling schedule. So, Bob and Don decided to become a quartet again. The first choice drummer was George Babbit. Don’s sister Jacqueline knew Bob. He was invited to audition and it was apparent, that he was a talented drummer. However, his age meant he wouldn’t be able to play in the bars The Versatones played in. So the search continued for two more Versatones. Eventually, Nancy Claire introduced Bob and Don drummer Buddy Dumas and bassist Earl Herbert. This was the latest of many, different lineups, of The Versatones. The only constant was Bob and Don. However, this latest lineup recorded a demo tape. Soon, The Versatones would be ready to enter recording studio. There was a problem though. A doo wop group called The Versatones released a single. This was a huge problem. It necessitated a change of name for Bob and Don’s Versatones. Names were proposed and rejected. Eventually, someone suggested The Adventures. Don suggested shortening the name, and calling themselves The Ventures. This was the first chapter in The Ventures’ story. Further chapters of The Ventures’ story can be found on The Ventures-In The Vaults Volume 5, which was recently released by Ace Records. The Ventures-In The Vaults Volume 5 features twenty-six tracks. Only two of these tracks have been released before. The remainder of the tracks have been for too long, hidden away, in The Ventures vaults. Not any more. They make their debut on The Ventures-In The Vaults Volume 5. The story behind these songs begins back in 1959. The Ventures recorded their debut on 20th September 1959. Cookies and Coke featured Bob, Don and George Babbit. Don’s mother Josie had the single mixed and 500 copies printed. However, despite her best efforts, the single failed to sell. Neither did it make radio playlists. For The Ventures, this was a huge disappointment. Bob and Don returned to Tacoma, and working on building sites. They still played music, and got a spot playing in a nightclub the Blue Moon. Soon, The Ventures built-up a loyal audience. The Ventures were one of Tacoma’s most popular groups. This meant The Ventures would be able to record more recordings. However, they needed a bassist. Then Nokie Edwards entered their lives again. When Nokie reentered The Ventures’ lives, he was clutching a Fender Precision bass. He’d bought it from a pawn shop. Nokie asked if he could sit in with The Ventures. They agreed and Nokie made a guest appearance. It was an arrangement that worked well, and one that they’d revisit. Over the next few months, Nokie occasionally sat in with The Ventures. Then when Buck Owens, who Nokie was working with decided to head to California, Nokie was without a gig. It was agreed he’d become a member of The Ventures. This was the latest incarnation of The Ventures. Over the next few months, drummers Stan Smith and Bob Babbit briefly become members of The Ventures. So did bassist Earl Herbert. Saxophonist Keith Schumaker even briefly, became a Venture. However, as the 1959 became 1969, Bob and Don became even more determined to make The Ventures a success. 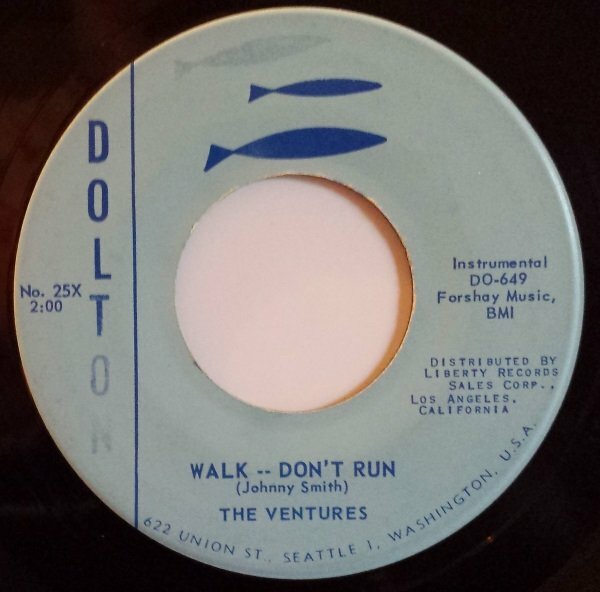 The Ventures first single of the sixties was a cover of Walk, Don’t Run. Recorded on 22nd March 1960, Walk, Don’t Run reached number two in the US Billboard 100. This resulted in the release of The Ventures’ debut album Walk, Don’t Run. It was released in December 1960 reached number eleven in the US Billboard 200 charts. That wasn’t the only hit single The Ventures had in 1960. 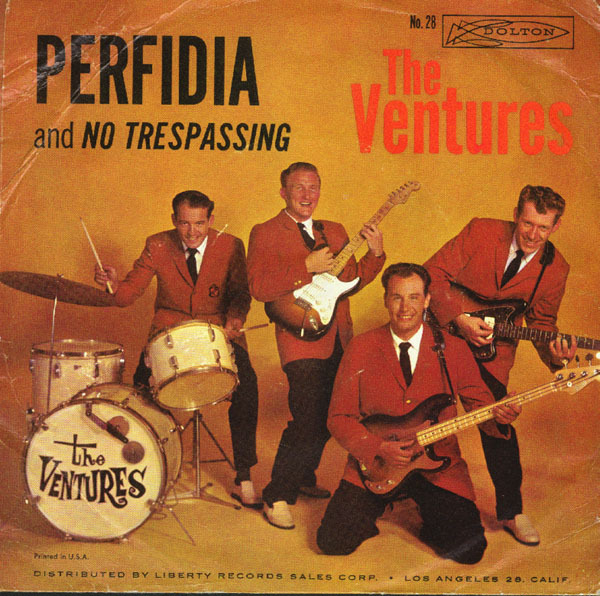 Perfida gave The Ventures their second hit single, when it reached number twenty-eight in the US Billboard 100. For The Ventures, this was the start of a run where they’d go on to sell over 100 million copies. Between 1960 and 1970, The Ventures released over fifty singles and a remarkable, thirty albums. They were easily, one of the most prolific instrumental bands. With a lineup that’s best described as fluid, the commercial success continued to come The Ventures ways. Sadly, after 1971, success began to elude The Ventures. They were and still are, a musical phenomena. It hadn’t been easy for The Ventures. They’d spent two years struggling to make a breakthrough. What’s more, they struggled to find a settled lineup. Bob and Don were ever-present. However, other members came and went. Some stayed longer than others. In Bob and Don’s case, they’ve been at the heart of The Ventures’ success story. This means over 200 albums and over sixty singles. 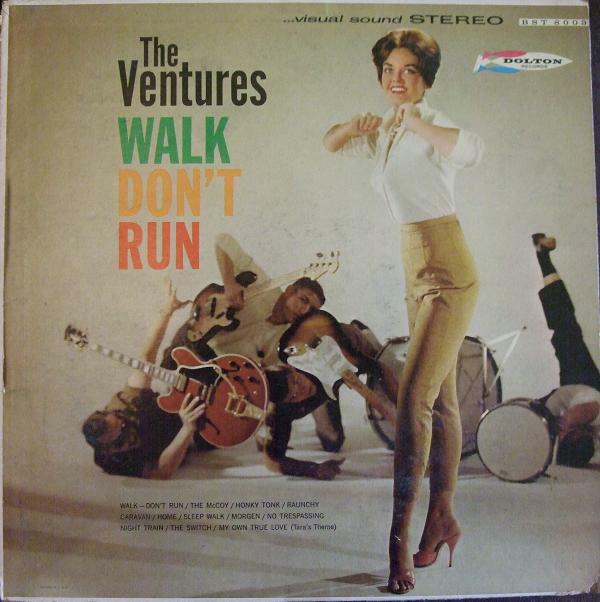 Collectively, The Ventures have sold over 100 million records. 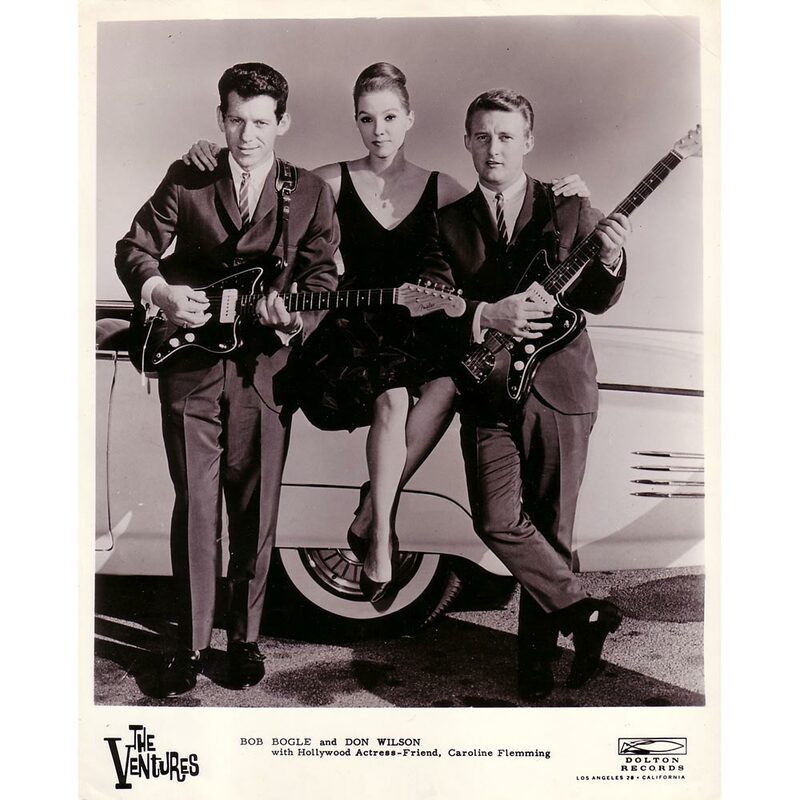 The Ventures-In The Vaults Volume 5 is another addition to The Ventures’ discography. 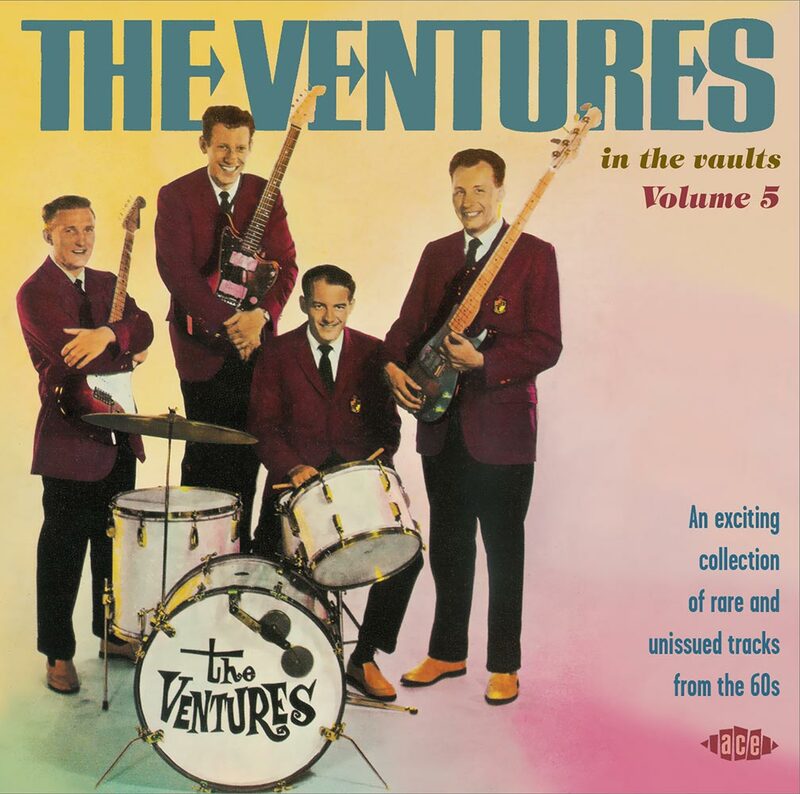 Mostly, The Ventures-In The Vaults Volume 5 features previously unissued tracks. They were recorded between 1959 and 1963. For fans of The Ventures, this means musical gold. After all, these tracks feature The Ventures as they’re evolving as a band. These tracks can be broadly separated into unreleased tracks, alternate takes and live studio recordings. The unreleased versions on The Ventures-In The Vaults Volume 5 include Getaway, Mr. Blue, Let The Four Winds Blow and Hank Marvin of The Shadows’ I Want You To Want Me. There’s also a live studio recording of The Shadows’ classic Apace. This seems fitting, one of America’s premier instrumental bands covering a track penned by the leader of Britain’s biggest instrumental bands. There’s much more on The Ventures-In The Vaults Volume 5. Other unreleased tracks include a cover of Duane Eddy and Lee Hazelwood’s The Lonely One. Then there’s a compelling cover of Leiber and Stoller’s Kansas City. However, The Ventures’ weren’t just a cover’s band though. The Ventures were talented songwriters. Don Wilson penned Death Of A Matador, and with Bob Bogle and Mel Taylor cowrote numerous other tracks for The Ventures. This includes Bogie’s Tune, Scarlet Sunset, Country Gravy Aka Turkey ‘n’ Taters, Bossa Nova Beach Girl, Shake It Easy and Fuzz Factor. They all feature on The Ventures-In The Vaults Volume 5. So do a number of alternate takes. Alternate takes on The Ventures-In The Vaults Volume 5 include Ventures Stomp, Ups ‘n’ Downs, Sealed With A Kiss, Lady Of Spain and Acher Bilk’s Stranger On The Shore. These tracks reinforce how versatile The Ventures were. So do the live studio recordings on The Ventures-In The Vaults Volume 5. Slaughter On The Tenth Avenue is a reminder of surf’s glory days. There’s also a nod to The Shadows. That’s fitting. The Ventures cover Apache, The Shadows’ classic. It’s as of they’re paying homage to Hank Marvin and co. Wipe Out, the final live studio recording is a blistering end to The Ventures-In The Vaults Volume 5. This new take on an instrumental classic is worth the admission price alone. However, that’s not the end of The Ventures-In The Vaults Volume 5. The other two tracks on The Ventures-In The Vaults Volume 5, aren’t by The Ventures. 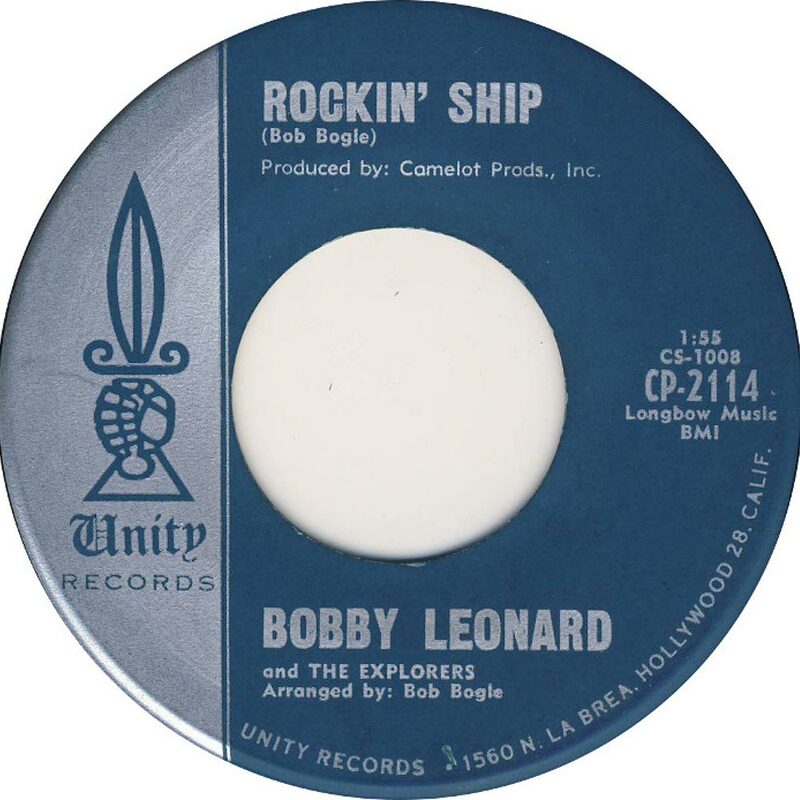 They’re Don Dixon’s 1961 single For Your Love and Bobby Leonard and The Explorers 1962 single Rockin’ Ship. Penned by Bob Bogle, he dawns his alter ego on this track. It’s a welcome inclusion on The Ventures-In The Vaults Volume 5. Despite four previous visits to The Ventures’ vaults, there was still much more for Ace Records to release. So, recently, the released The Ventures-In The Vaults Volume 5. It features twenty-six tracks, recorded between 1959 and 1963. Only two, which weren’t even by The Ventures, have ever been released before. So, for fans of The Ventures, The Ventures-In The Vaults Volume 5 is musical gold. Despite being founded in 1958, The Ventures still have legions of loyal fans. They hungrily await each instalment of the The Ventures-In The Vaults series. 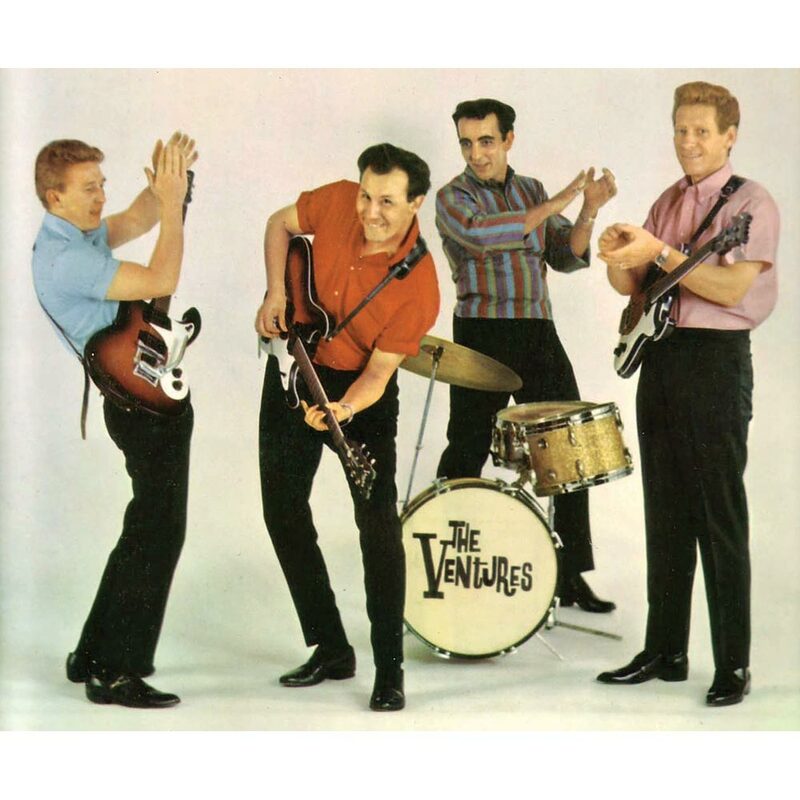 The Ventures-In The Vaults Volume 5 is a compelling collection of tracks. Cover versions and originals sit side-by-side. The unlikeliest of cover versions, including Stranger On The Shore and Sealed With A Kiss are given a makeover by The Ventures. They combine this with tracks they’ve written, including Bogie’s Tune, Scarlet Sunset, Country Gravy Aka Turkey ‘n’ Taters, Bossa Nova Beach Girl, Shake It Easy and Fuzz Factor. Some of the tracks were recorded live, others unused takes. These tracks give the listener an insight into how The Ventures worked. Some of the unreleased tracks and alternate takes could’ve been released. However, Don and Bob had high standards. Only the best was good enough for The Ventures. Even back in the late fifties and early sixties, they were perfectionists and protecting The Ventures’ brand. Only now, somewhat belatedly, do these tracks make their debut on The Ventures-In The Vaults Volume 5. The twenty tracks on The Ventures-In The Vaults Volume 5 are a reminder of one of the most successful instrumental bands, The Ventures. They sold over 100 million albums. If you’ve never heard of The Ventures and are wondering why, then the music on The Ventures-In The Vaults Volume 5 explains why. ← I’M JUST LIKE YOU:SLY STONE’S FLOWER 1969-1970.